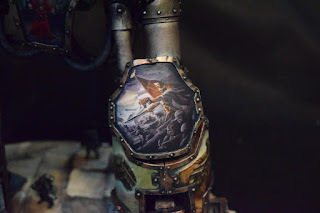 Hello everyone, I am back with another project, and it's a big one! 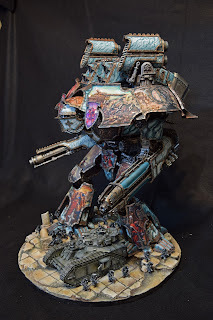 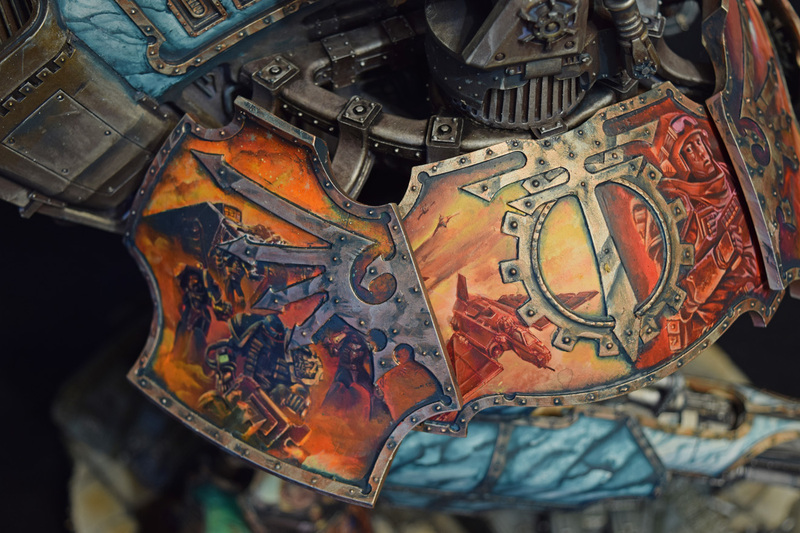 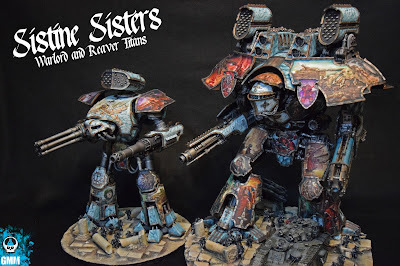 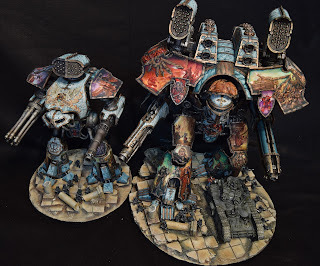 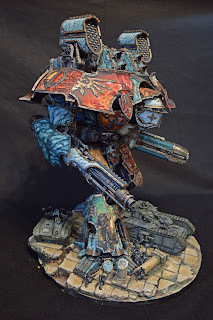 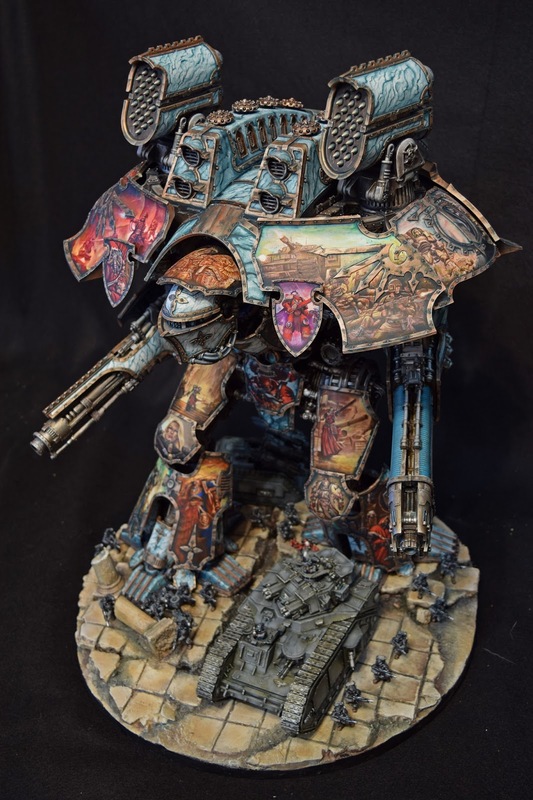 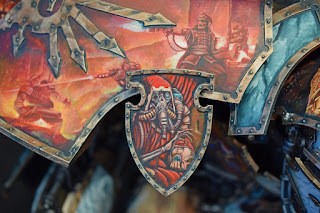 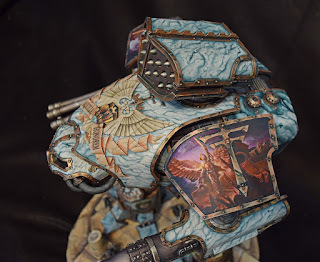 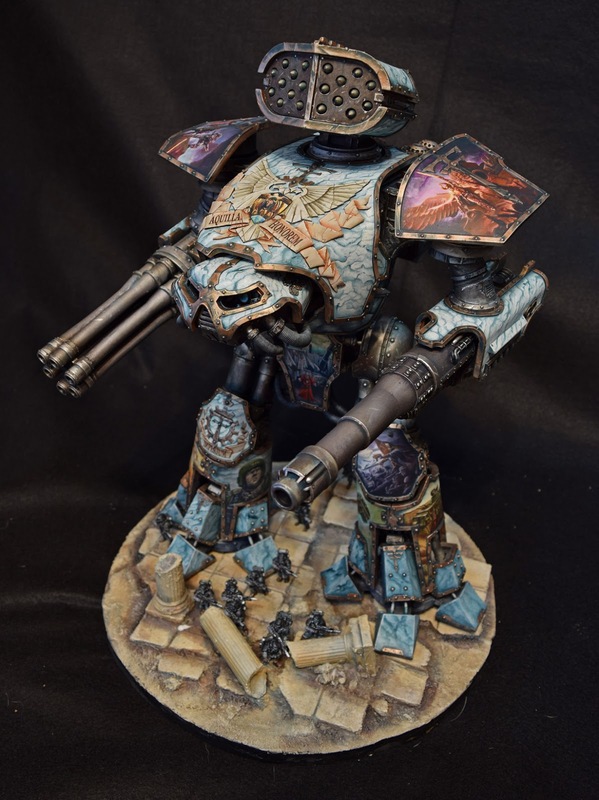 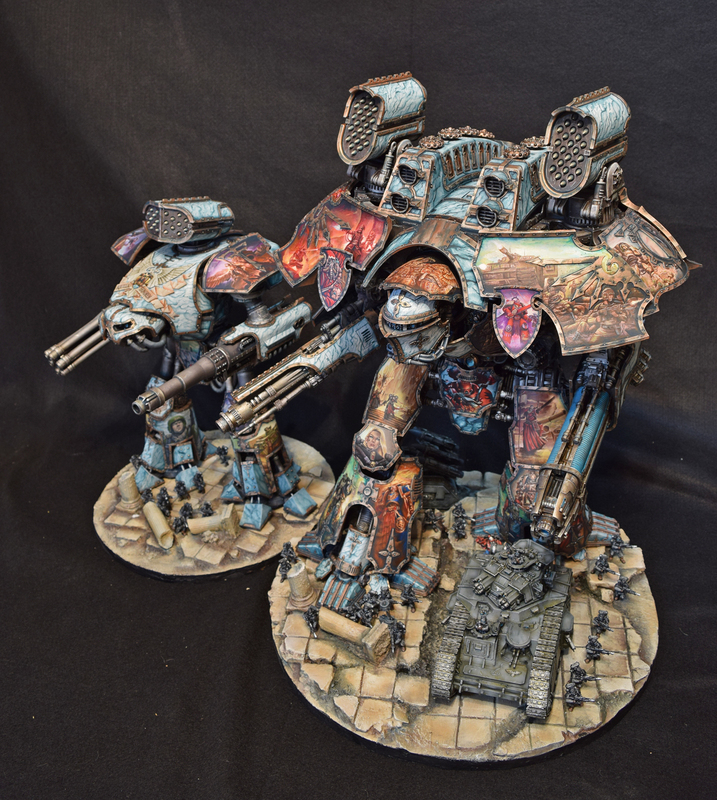 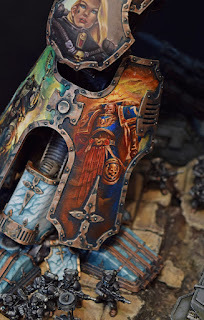 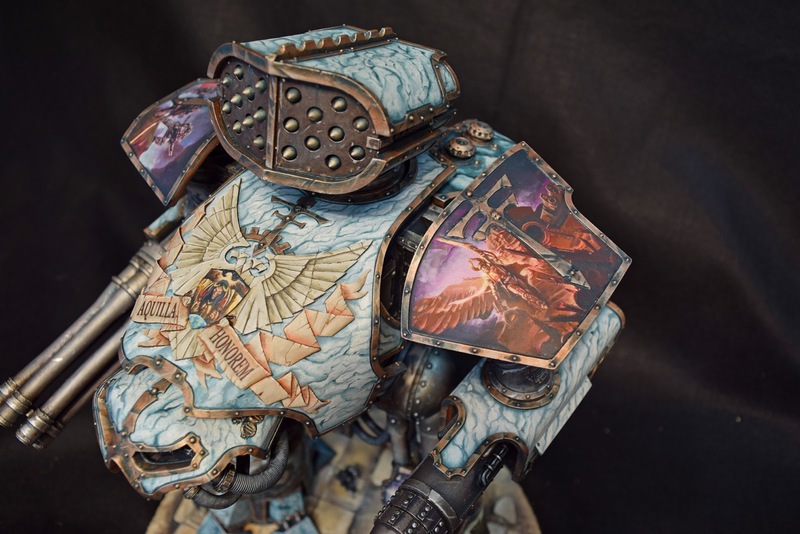 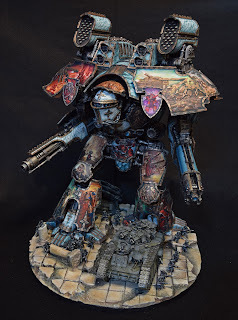 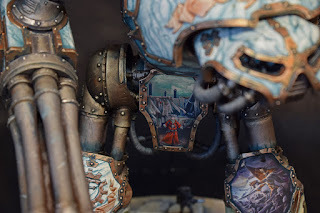 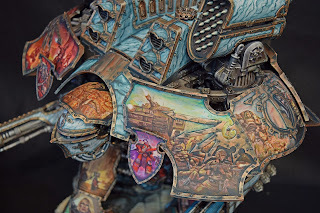 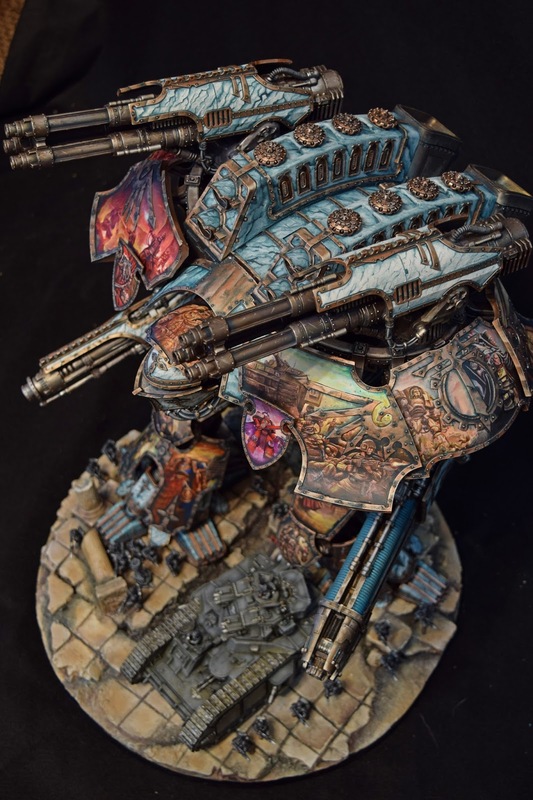 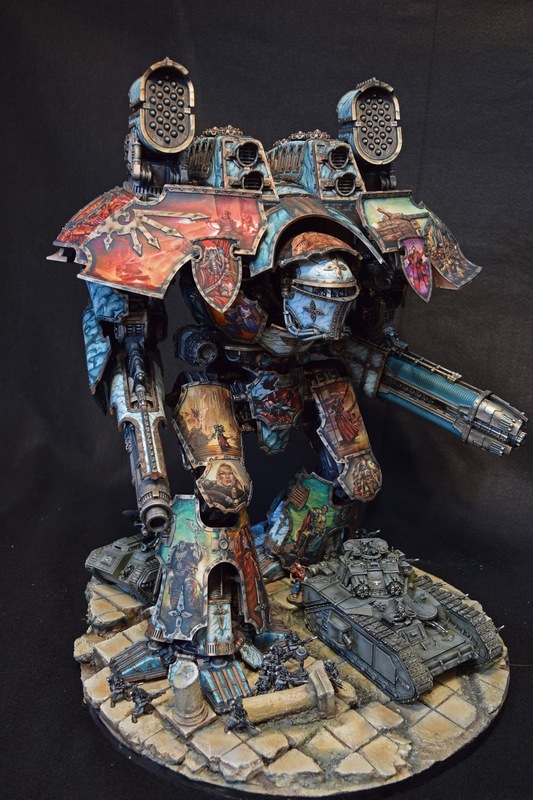 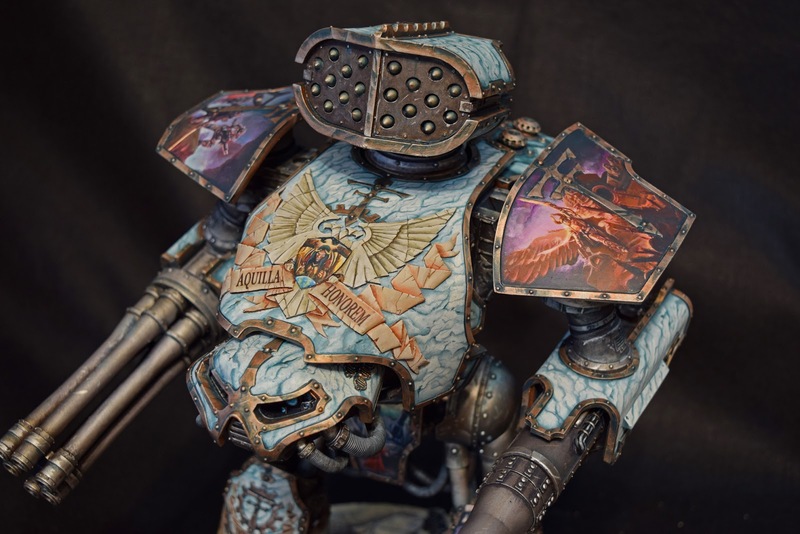 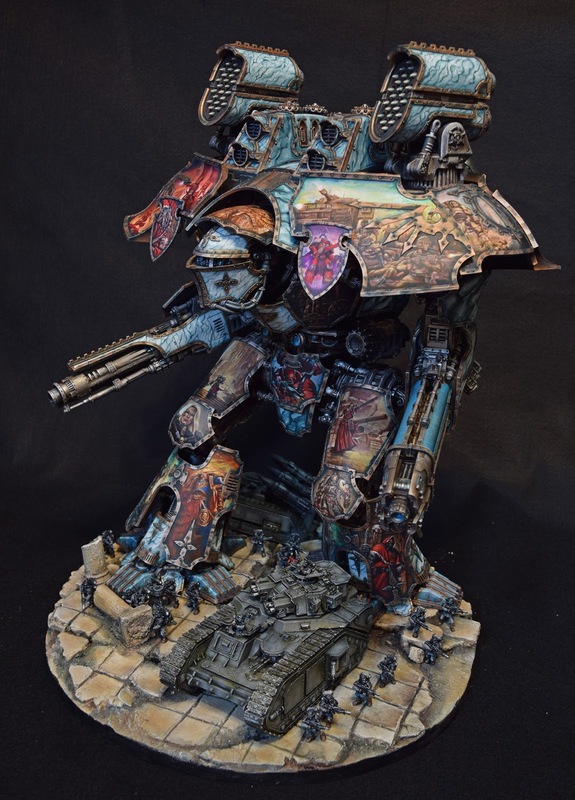 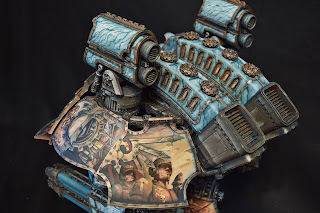 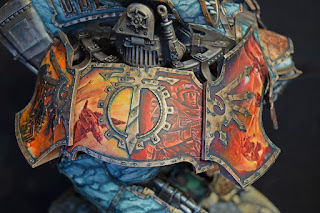 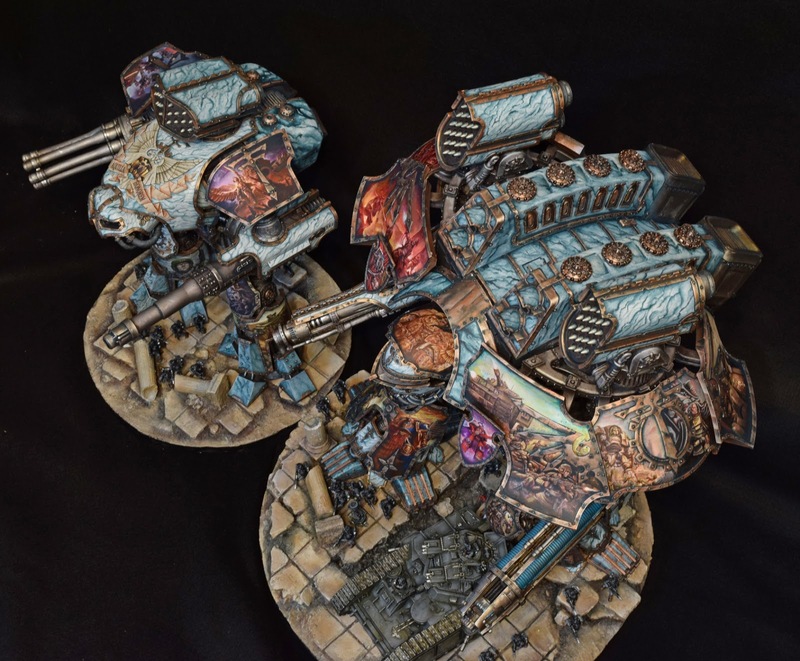 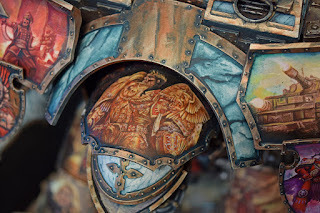 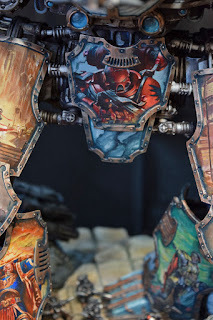 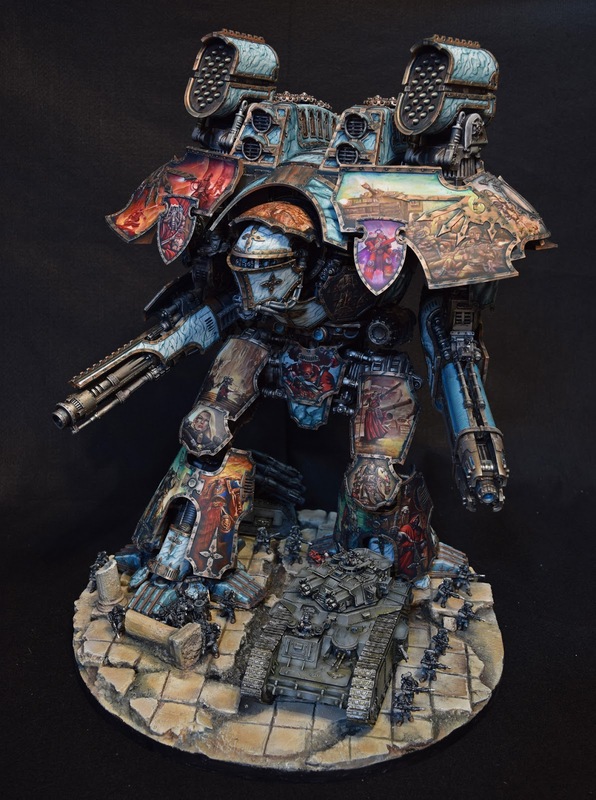 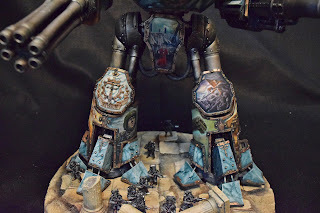 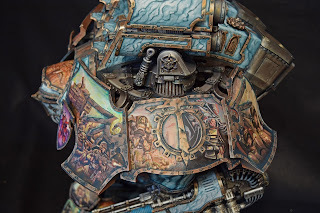 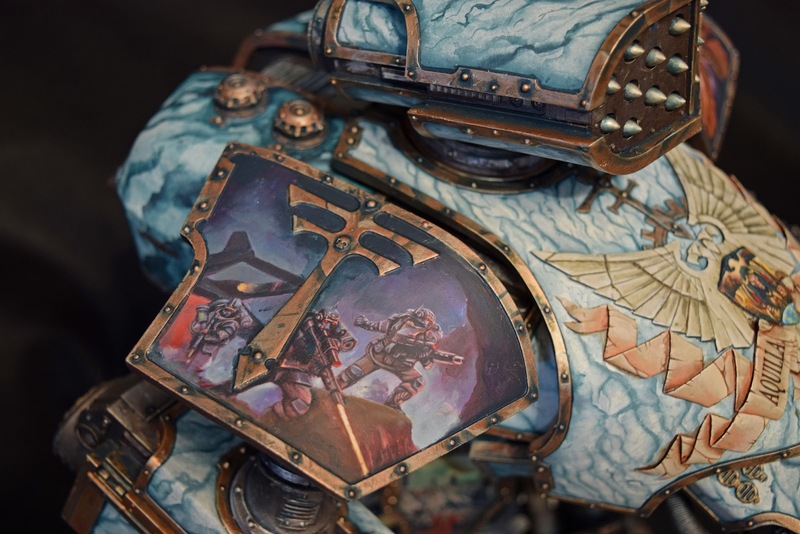 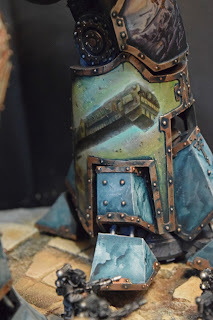 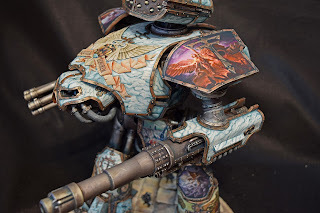 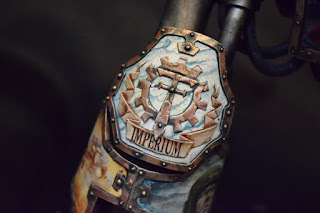 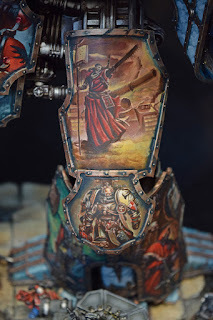 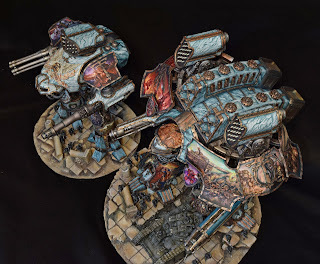 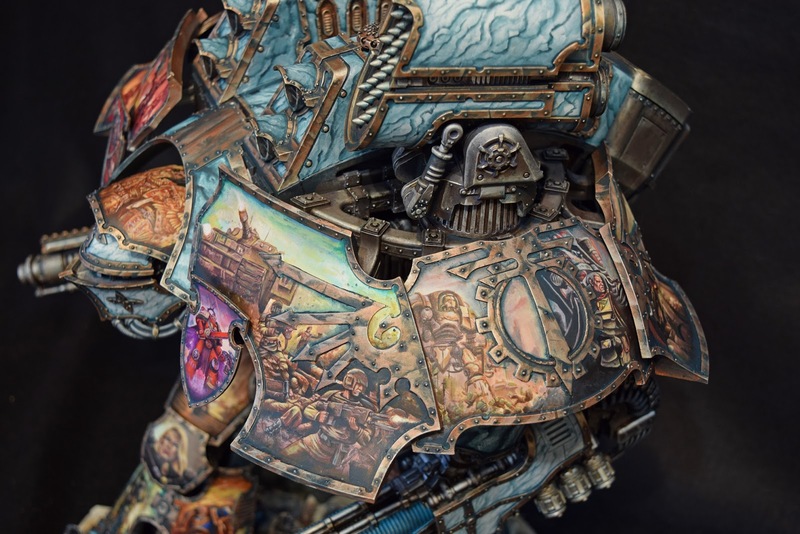 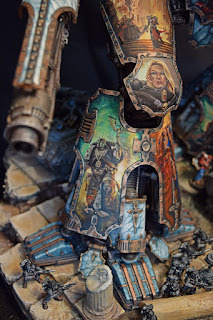 A Warlord and Reaver, decked out in freehand and marble. 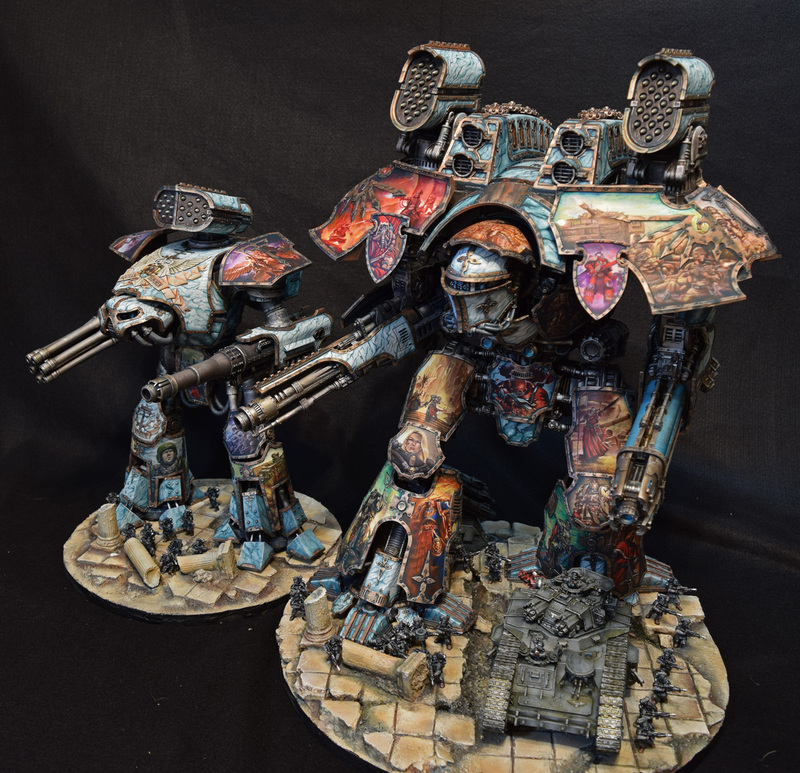 This project started as a rough idea of something for the glory of the Imperium, a set of parade Titans in gratuitous celebration of deeds and characters of all sort from across the universe. 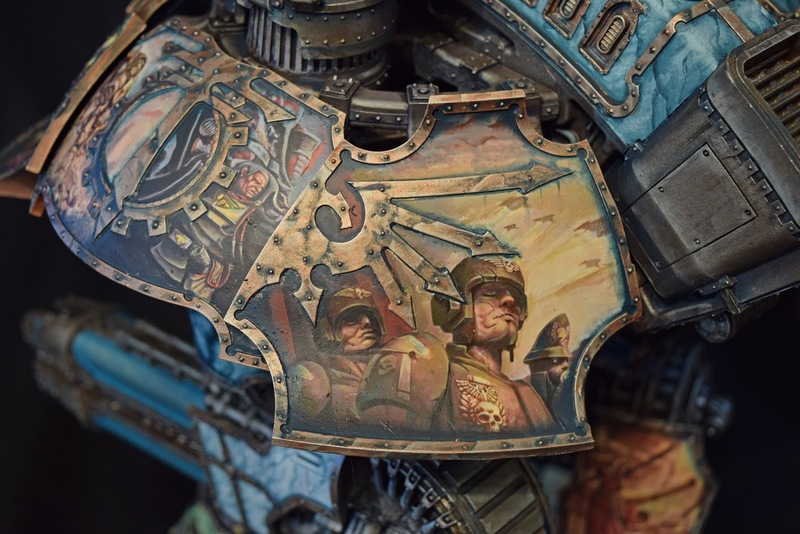 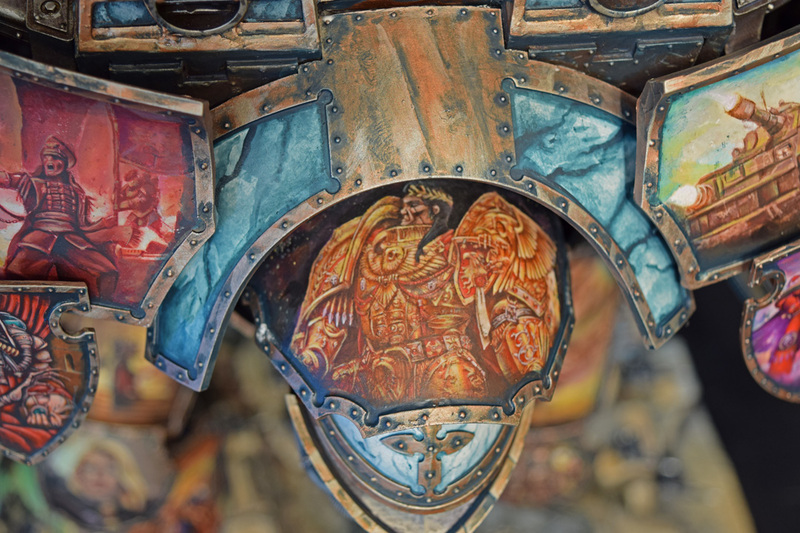 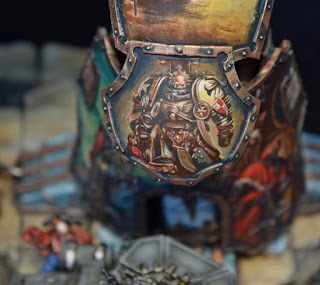 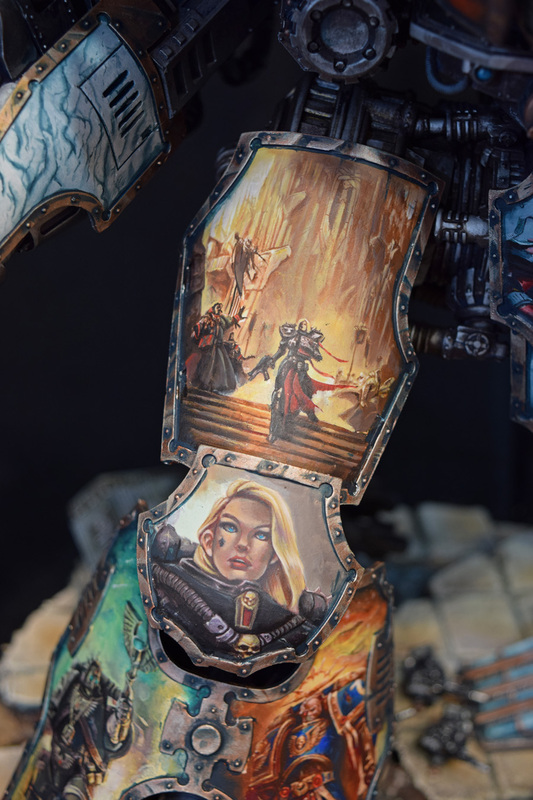 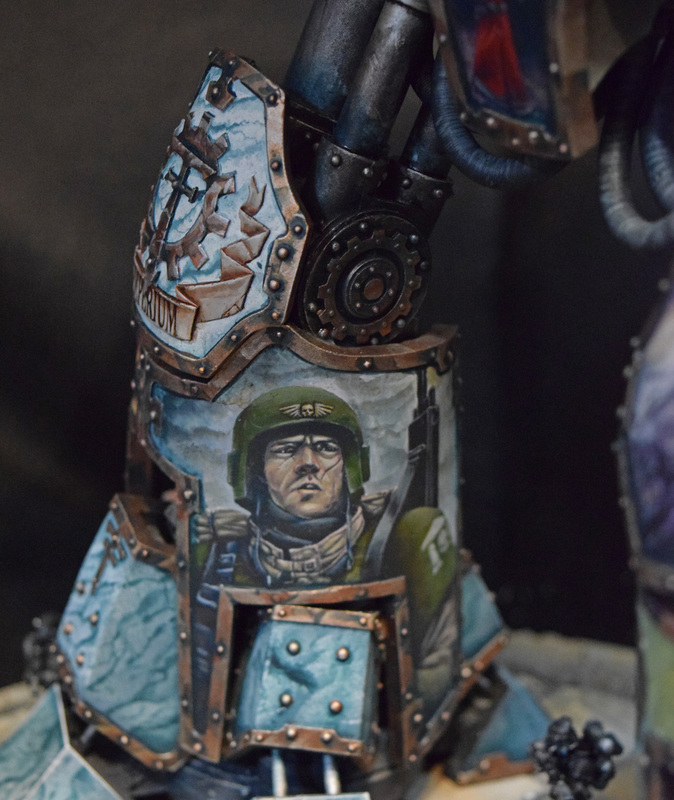 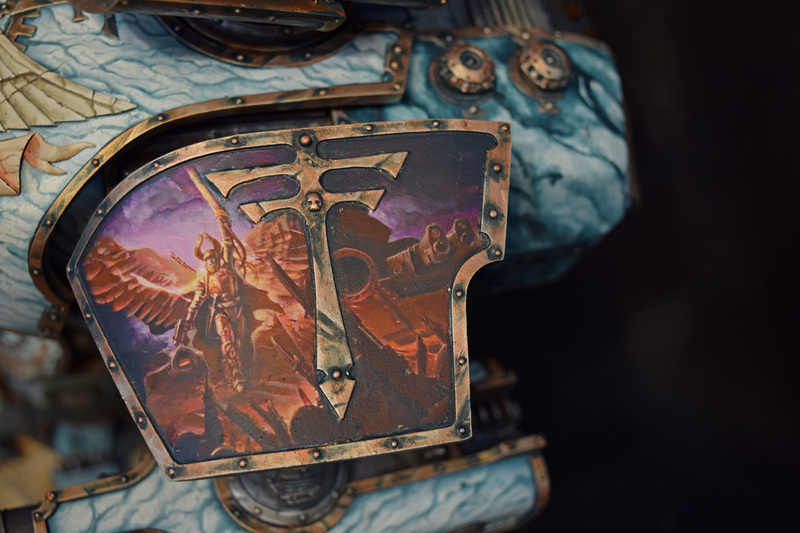 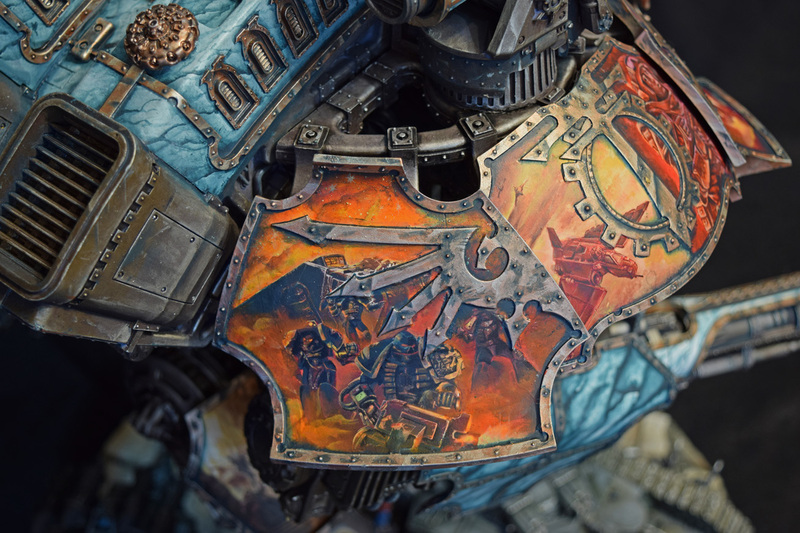 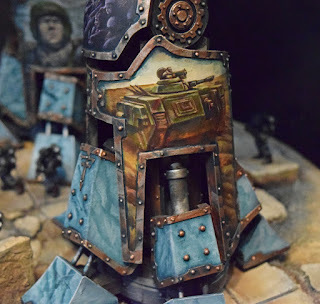 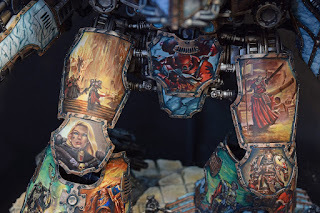 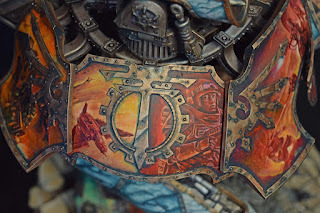 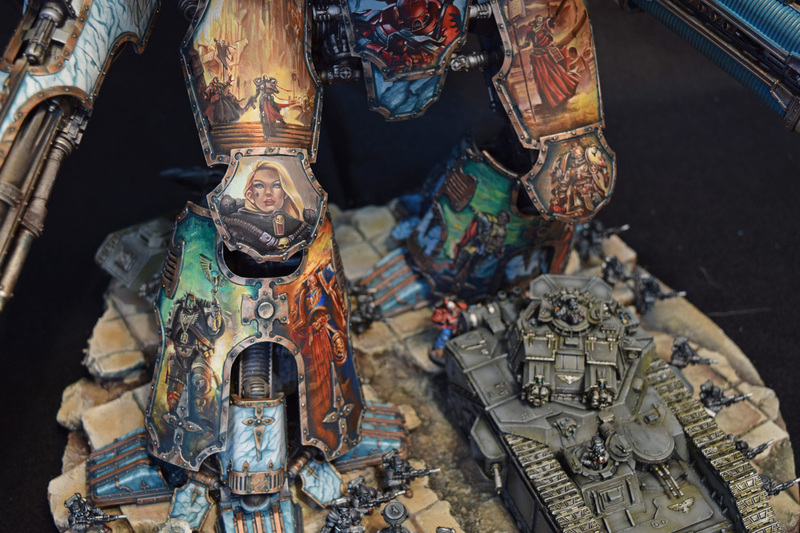 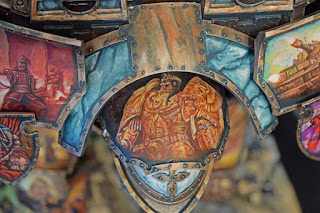 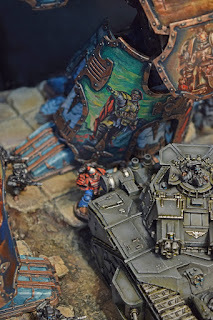 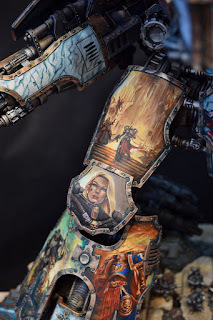 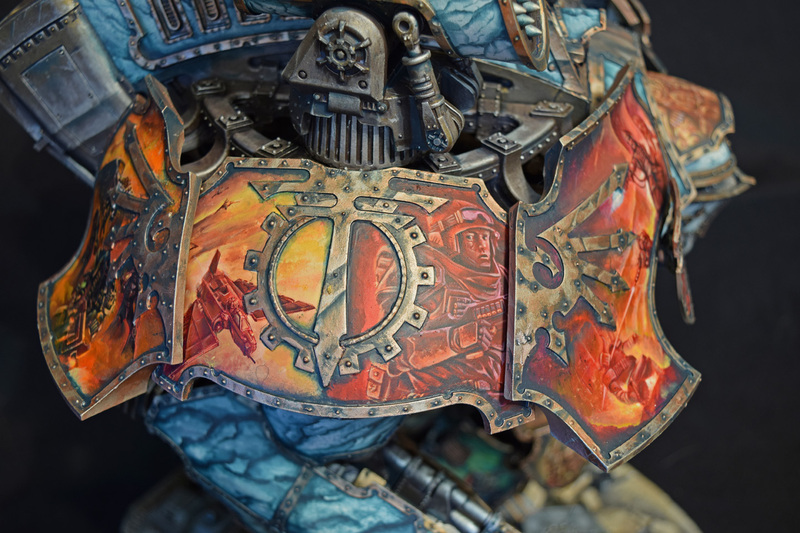 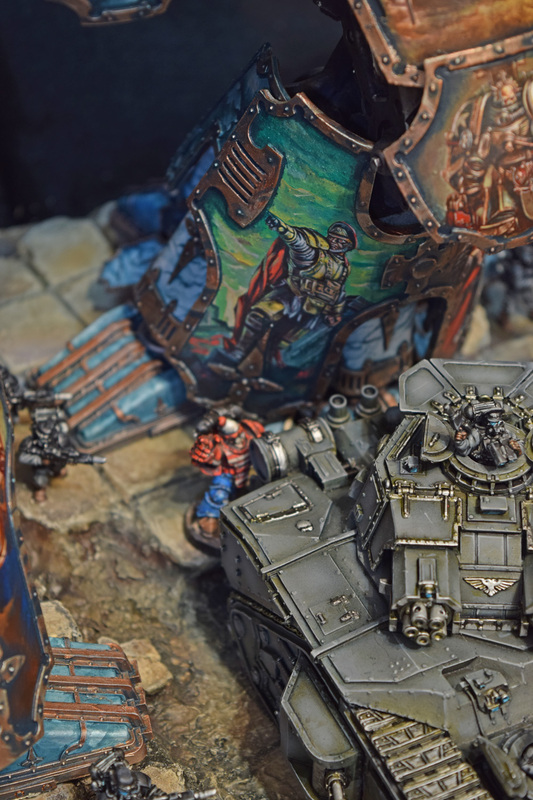 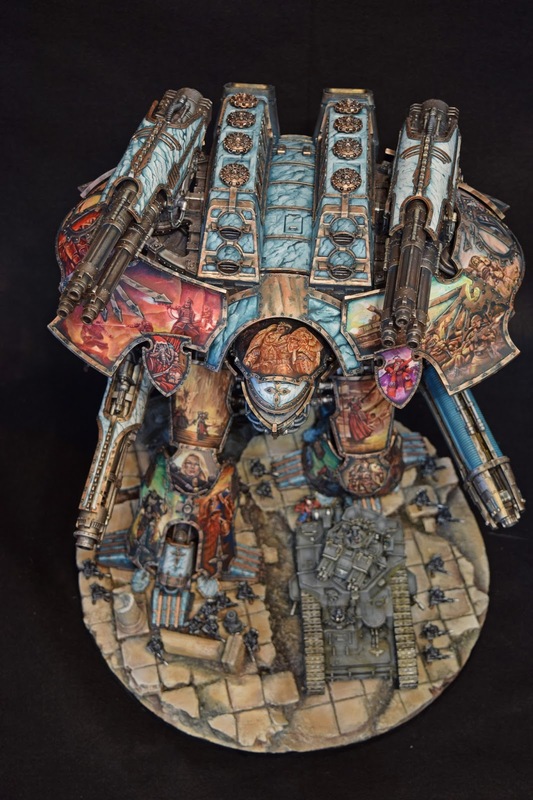 The customer's base request was a walking Sistine Chapel, kicked up a bit over the top to blend in with the 40k universe. 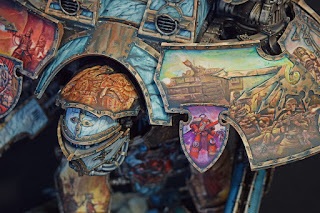 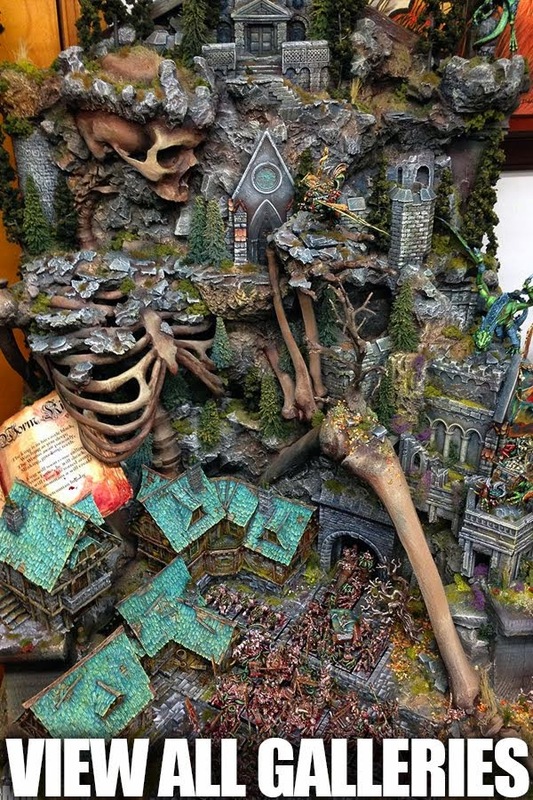 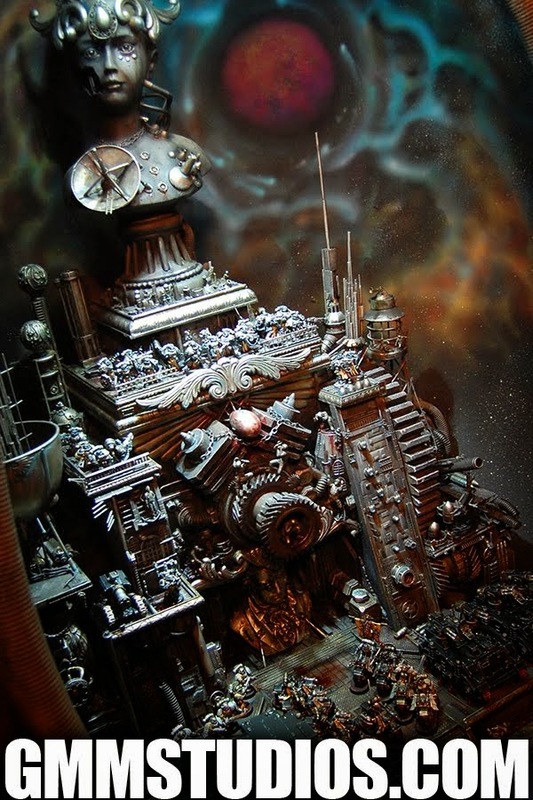 To begin he sent me a massive folder of all of his favorite images he had collected from the 40k background. 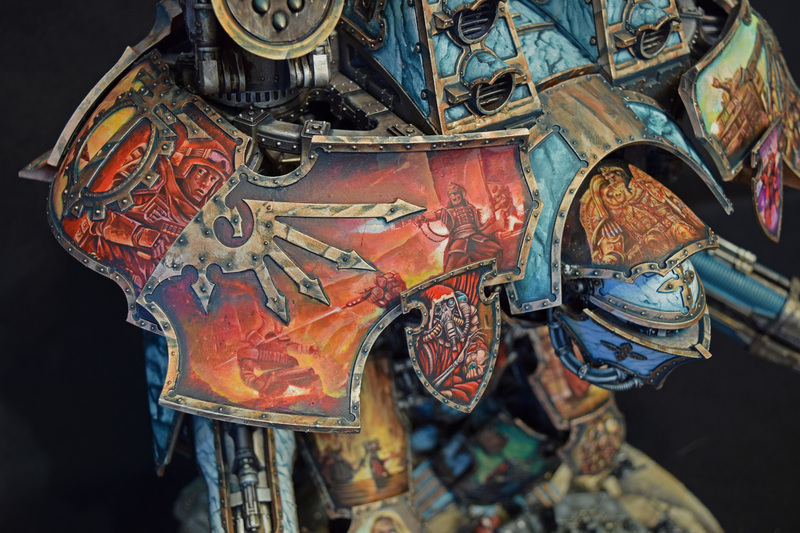 I then went over all of them and began to compose them across the panels of the Titans. It was important to him I kept to the general original look of the art, so instead of tweaking them, the existing colors and composition of each artwork was arranged to match the placement of the panels themselves with an overall eye to color from panel to panel. 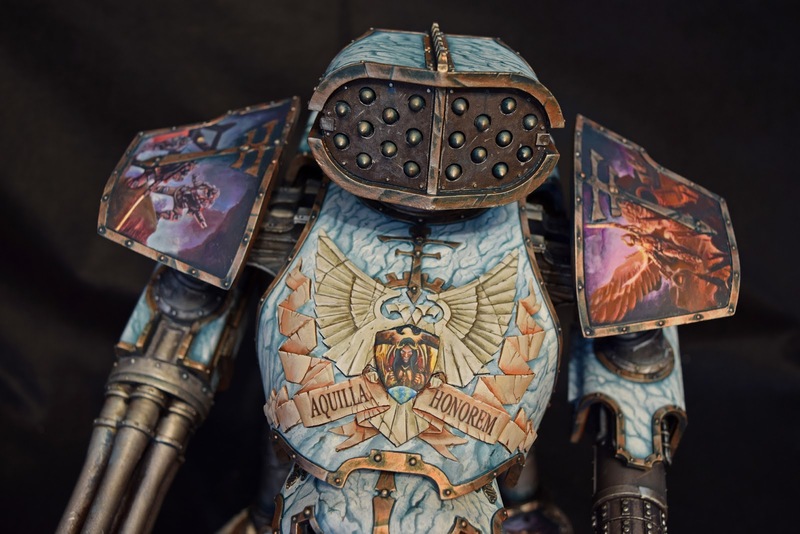 The marble was a natural choice to fit the aesthetic of a chapel, and much better than any single solid color for any panels too complicated for freehand to look right from all but one angle. Once this was figured out, it was a matter of finding a style to balance the freehand and marble to the eye overall, then it was off to the races. All important parts are heavy magged, with swappable weapons. 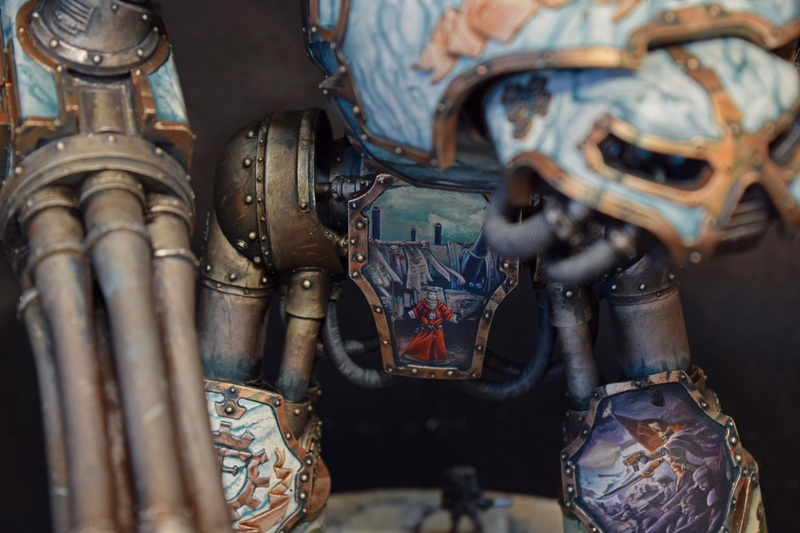 Head, torso, weapons, wrists, and more on each are magnetized and separate and articulate. 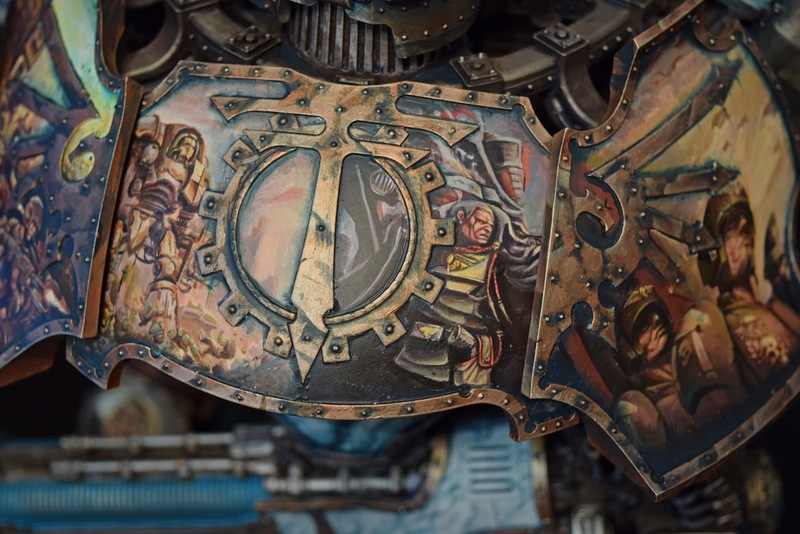 Any point that would take one, has a large roofing nail acting as a massive pin. The bases are 3/4" cut plywood, then sculpted over with clay for a crumbling tile look. 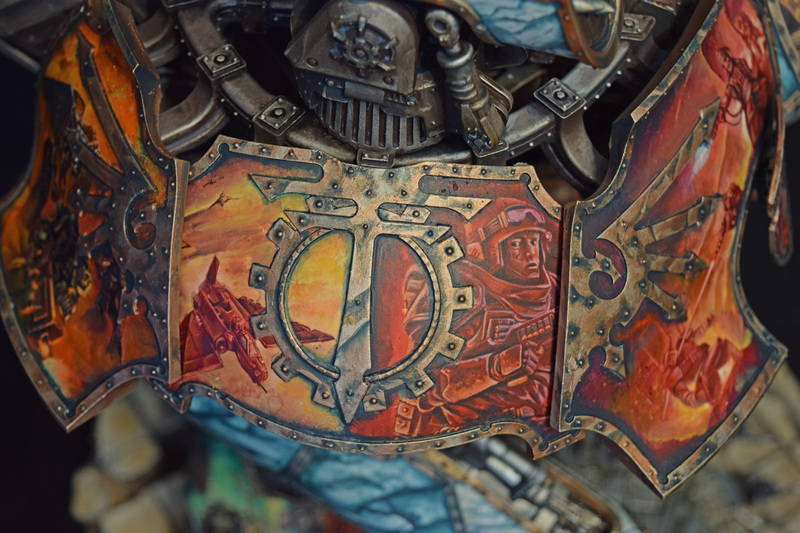 The Tians attach to the bases with heavy 3.5" deck screws counter sunk into the bottom of the bases, so they are removable. 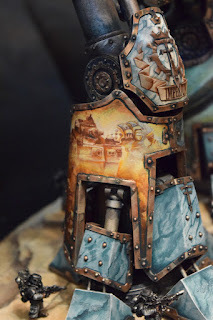 The pictures are deceptive, the Warlord titan base is a good 2-3" thick in the tallest bits. 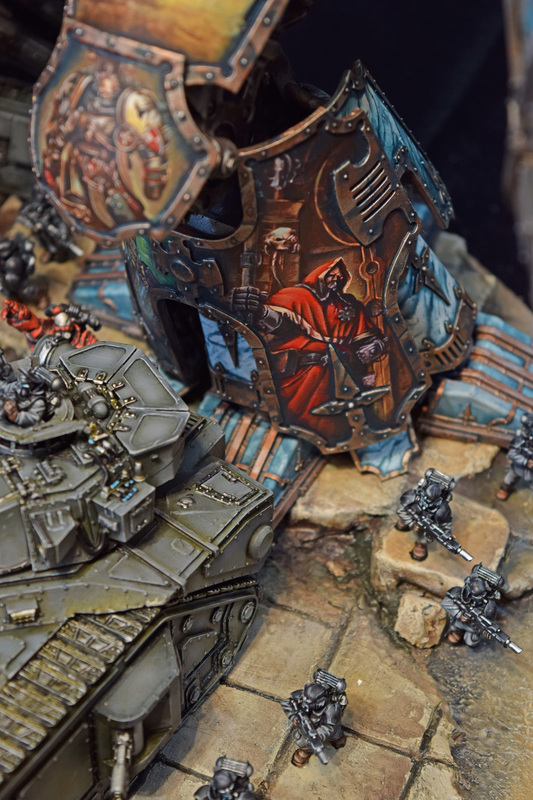 The models present on the bases are painted to match the customer's Imperial Guard army that these will be fighting alongside. These models were actually a surprise for him, and the tanks removable for play. 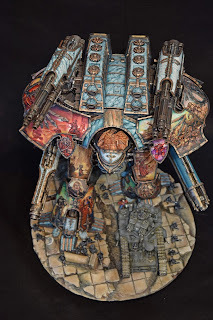 Funny a Macharius is a very exciting model, but by the end by comparison it was the least of surprises.